for an appointment, a second opinion or more information. When babies are born, the bones in their head are very soft. These soft bones allow for the rapid brain growth that occurs during the first year of life. As a result, these soft bones are easily molded. It is normal for a baby’s head to be somewhat misshapen for the first few days or weeks of life. Positional Plagiocephaly (PLAY-gee-oh-SEF-uh-lee) is a flat spot on the back or side of a baby’s head. It is caused by pressure on the bones of the skull before or after birth. This usually happens because of the way a baby likes to lie in their first few months of life. By itself, a flat spot on the young baby’s head is generally not a concern. Your child’s doctor or nurse practitioner will check to see if there is a problem. Sleep position. The most common cause is a baby’s sleep position. Babies sleep for many hours in the same position and this can cause the head to flatten in one spot. Placing babies in devices where they lay down throughout the day (car seats, carriers, strollers, swings, etc.) may worsen the problem. Medical problems or developmental delays. These conditions may make it harder for a baby to change positons. Because of their medical needs and fragility, babies with medical problems may spend lots of time in one position without being moved or picked up. Torticollis (Insert link to separate header) (TOR-tih-CALL-is). When the muscles in a baby’s neck become too tight, it can limit how much they can move their neck. These babies tend to always look to one side and may develop a tilt to their head. This can cause the baby to always rest on one spot of their head and develop a flat spot. Being crowded in the womb. Crowding may happen if there is more than 1 baby in the womb (as in twins). Sometimes it happens if the mother has a womb with an unusual shape. Specialists in our Craniofacial Center see and treat children with positional plagiocephaly. We also do research to better understand our outcomes and improve our treatments. 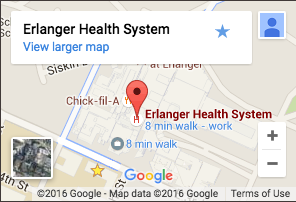 Erlanger Cleft and Craniofacial Center is the regions only cleft and craniofacial team. Because of our experience, we can recommend the right treatment at the right time to ensure the best outcomes for your child and your family. We will create a personalized plan of care of your child. Anytime someone is talking about reshaping your child’s skull it can be very scary. We will take time to explain your child’s condition and we will help you to fully understand your treatment options. We will help you to make the decisions that are right for your baby and your family. Our nurse practitioner will work with your family to make sure all of your questions are answered and help your family manage their way through the health care system. If a helmet is indicated in your treatment plan, an orthoptist will design a customized helmet and ensure its fit. Other experts may be consulted as needed to meet your child’s needs. Erlanger Cleft and Craniofacial Center provides craniofacial (skull and face) care for children of southeastern Tennessee and far beyond. Families that do not live here in the Chattanooga area may use an orthoptist in their local area to make and fit a helmet. We will provide a referral for your baby if needed. What are the Signs and Symptoms of Positional Plagiocephaly? Often it is the parents that first note that their child’s head has a flat spot. Typically, the back of the child’s head is called the occiput (AHK-suh-puht), will become flattened on one side. Positional plagiocephaly can look different depending on which part of the skull has a flat spot. Usually, the flatness is more on one side than the other. Often there is less hair on the part of the head that has become flattened. When looking down on the baby’s head from above, the ear on the flattened side may be pushed forward. In more severe cases, the forehead may be uneven. When torticollis is the underlying cause, the baby’s face, jaw and neck may be uneven as well. Flat spots on a baby’s head are common and a flat spot does not always mean there is a problem. Your child’s doctor or nurse practitioner will check to see if your baby needs treatment. How Do You Diagnose Positional Plagiocephaly? Your child’s doctor or nurse practitioner will also check your child’s development. Some children with positional plagiocephaly may have a mild developmental delay. Lab tests, X-rays and CT scans are not usually necessary. Positional plagiocephaly may sometimes look like another condition called craniosynostosis (KRAY-nee-oh-SIN-oh-stow-sis) (Add hyperlink to condition). Craniosynostosis and positional plagiocephaly require very different treatment plans. Our team is experienced in detecting the signs that will help us tell these conditions apart. How Do You Treat Positional Plagiocephaly? At Erlanger Cleft and Craniofacial Center, our treatment plans are customized for your child’s and your family’s needs. The most appropriate treatment for positional plagiocephaly depends on the cause, your baby’s age, and how much of their skull is affected. Torticollis - If muscle tightness limits your baby’s movement and is the cause of your baby’s flat head, our team may recommend home exercises to help your baby stretch their neck muscles. For more severe cases we may refer you to a physical therapist. Positioning - If lying in the same position is the cause of your baby’s flat head and the baby is 5 months of age or less, the most important treatment is to change the position of their head when they lie down. Our team will customize a positioning program (insert hyperlink to positioning brochure) to your baby’s needs. We will help you keep your baby off the flat portion of their head as much as possible. Persistent Flattening - If changing your baby’s position does not reduce the flatness in their head and they are over 5 months of age, a special helmet may be recommended to help fix your baby’s uneven head shape. If your baby’s positional plagiocephaly is moderate to severe, your doctor or nurse practitioner will talk to you about whether helmet therapy is right for your baby. At Erlanger Cleft and Craniofacial Center, we custom fabricate a helmet for your baby. The helmet fits snugly on the round parts of the head and is looser on the flat parts of the head. This fitting encourages the flat parts of the skull to expand as your baby’s head grows. Your baby wears the helmet 23 hours a day. It is important that your baby keep the helmet on as much as possible to encourage the growth in the correct directions. How long your baby must wear the helmet depends on the severity of the flatness and your baby’s age. Most children wear the helmet for 4-8 months. Always places your baby on their back to sleep. Choose different positions, activities and ways for your baby to be held. It is important to provide variety to the baby. Alternate the position of the baby in the crib. If their feet generally face one direction in the crib, turn the baby so that the feet face the other direction every few days. Move the position of the crib in the room so that they have to look in different directions to see the door or window. When your baby is awake, find ways for them to play and move while on their tummy. Do this 4-5 times a day. Tummy time can be initiated as soon as your baby can raise their head, generally by about a month of age. Give your baby lots of time sitting in laps and cuddling. When they are awake, avoid long periods of lying on their back or strapped to a car seat. When holding or feeding your baby, change the infant’s head position from side to side frequently. Encourage activities on both sides of the child to encourage them to reposition to each side of their head. Encourage activities such as crawling, rolling, reaching, pushing, pulling and grasping. It is okay to use car seats, strollers, bassinets, cribs, and playpens when necessary, but babies need the opportunity to move that do not happen when they are sitting in only one position.